Now from the successful Breathe line a handy Vapor Stick for free breathing at any moment, in every season! RECOMMENDED! 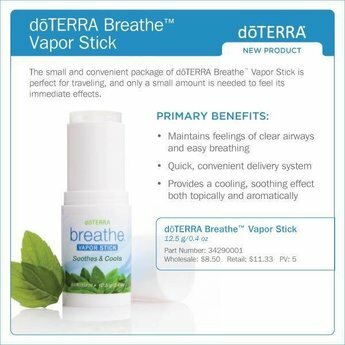 Delivery time: Shipment on the next business day if ordered before 16:00 h.
The small and convenient package of doTERRA Breathe Vapor Stick is perfect for traveling, and only a small amount is needed to feel its immediate effects. The vapor stick works in conjunction with the other do–TERRA Breathe products, providing powerful respiratory support for you and your family.